We often hear about the serious threats to worldwide bee populations and how this is a danger to our food security but how about our indigenous bees? Australia has over 1600 identified species of native bees varying in size from a tiny 2mm to an easily visible 24mm. As well as being important for our biodiversity and the pollination of our native plants, our native bees have also been found to be effective pollinators of many agricultural crop species, including avocadoes, tomatoes, macadamias, strawberries, rockmelons, watermelons, mangoes, passionfruit, blueberries, citrus and lychees. Research trials are continuing to identify the potential of using native bees with other crops. With their small size allowing them to negotiate tiny flowers, native stingless social bees have in some cases been found to be superior pollinators to honey bees. 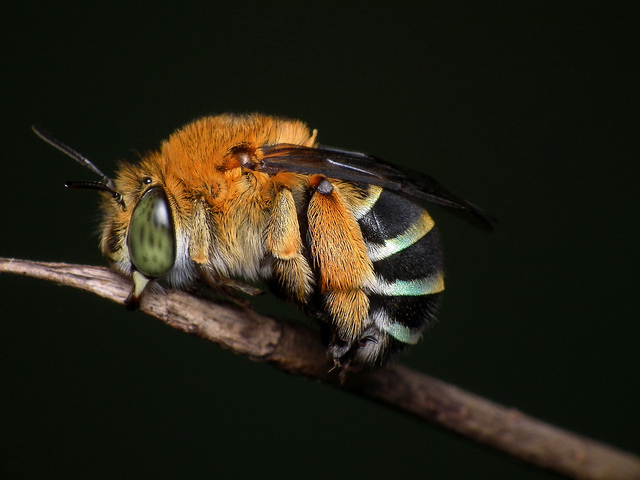 Some solitary bees have also been discovered to have a number of unique characteristics, such as the blue-banded bee that uses a technique called buzz pollination to effectively pollinate crops such as tomatoes. Research is being carried out in Australia to find out if native bees could support the crop pollination work of the honey bees if the varroa mite enters the country, where it is predicted to decimate honey bee populations. As far as we know native bees are resistant to the varroa mite. What are the threats to Australian native bees? Learning some basic information about your buzzing neighbours will help you to understand how you can help out. I’ve really enjoyed doing some bee spotting in the garden and have been amazed by how many different bee species I’ve seen. Spotting a giant metallic green Carpenter bee was a real highlight for me last weekend – it was BEEautiful! Check your local library for books, search for workshops in your area, and look at websites such as AussieBee. 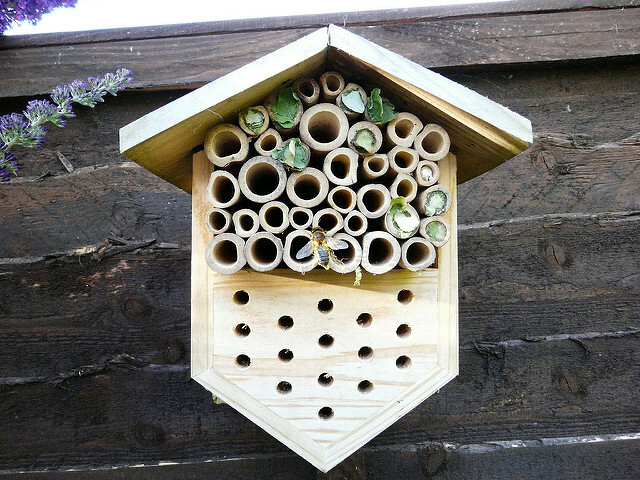 You will soon be drawn in by the beauty and intriguing behaviours of both social and solitary native bees. Pesticides not only kill off pests, but they also kill beneficial insects such as bees. It is particularly important not to use pesticides when plants are flowering or when bees are likely to be flying because this puts the bees at greatest risk. This is a great DIY project where you can unleash your creativity. A hotel provides bees with an artificial nesting site and helps bee populations who have had their habitats destroyed by land clearing and urbanisation. Your hotel can be as simple or as complex as you choose. Use non-treated wood, provide some protection from rain, and drill some different sized holes for different types of bees to nest in. You may be tempted to tidy up every section of your garden to keep it neat but to support burrowing bees it’s important to leave some undisturbed ground for them to burrow into to make nests. When clearing for landscaping check for signs of native bees. Reed bees like to nest in pithy twigs of plants such as fern trees and lantana, while other bees may be nesting in old beetle holes or in the hollows inside large trees. 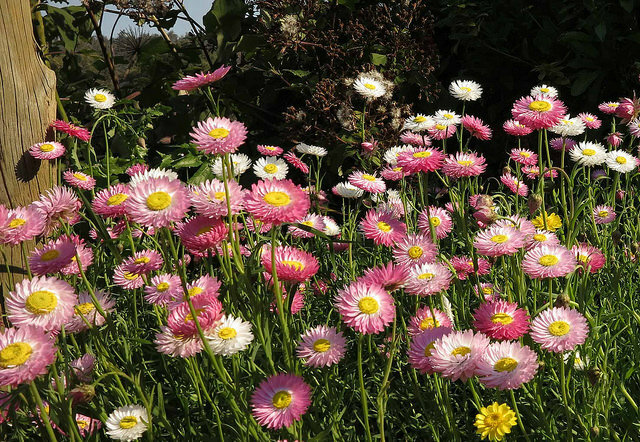 Bees are drawn to flowers in clumps of one metre or more, so if possible plant your flowers in groups. Plants such as lavender and borage are generally this size anyway. Bees appear to be particularly attracted to the colour blue but enjoy a diversity of colours. Some bees prefer to stick to native Australian flowers but many will enjoy feasting from both native and exotic species so include a mix of both to your taste. Grow a varity of flower shapes and sizes to cater for small and large bees, and those with both long and short tongues. This is a time when bees require plenty of food so make sure you have some early flowering varieties of plants. 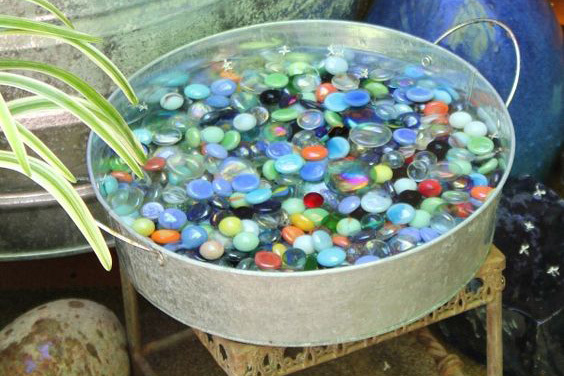 Some pebbles in a birdbath or some wet sand is a perfect source of water for bees. Open water can be a risk because bees often drown. Citizen science projects are a fantastic way of contributing to environmental causes, learning and having loads of fun along the way. They are a great activity to do with kids. Currently Bowerbird has a project with native bees. You can also participate in the Wild Pollinator Count from November 13th to 20th. The observation only takes 10 minutes and plenty of resources are provided. You don’t need to be an expert to join in. 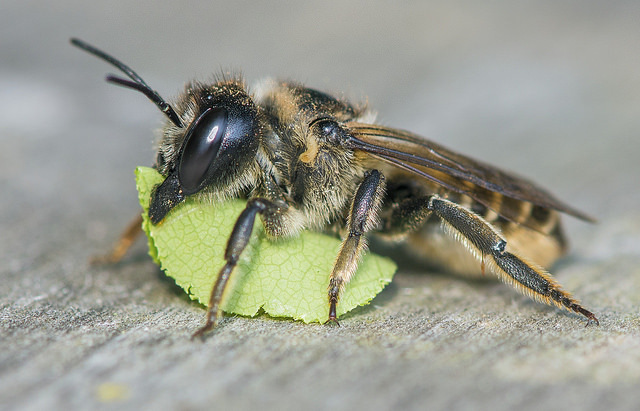 Take some time this week to see if you can spot any native bees in your garden and begin taking some steps towards making your backyard bee-friendly. By working together we can help preserve these special pollinators. 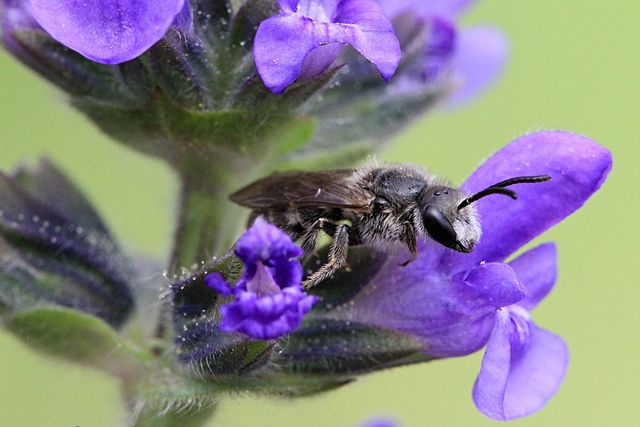 Which flowers do native bees like best?